to address environmental crisis. Protei would also be used to collect plastic in the oceans, measure radioactivity off Japan, monitor water quality, collect climate change data, and go to marine areas which are not accessible to people. Protei is a community-generated technology licensed under Open Hardware by Open_Sailing (UK – USA), randomwalks (Korea) and Amorphica (Mexico). Protei was recently produced by V2_ Institute for the Unstable Media in Rotterdam (NL). 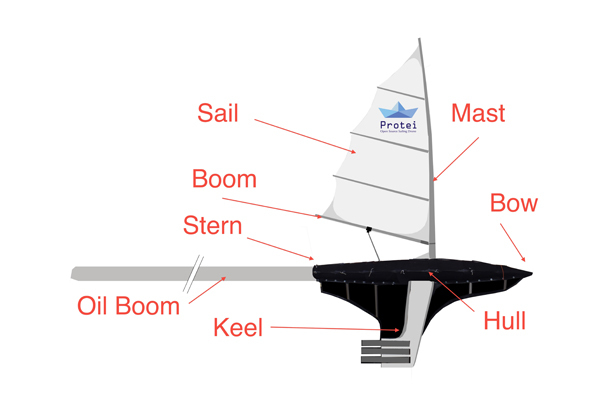 Protei has been generously funded by over 300 backers on Kickstarter.com and is now constituting itself as an R&D and innovation start-up. 3) Navigational for “Protei” locations – so that we can send Protei where necessary and track fleet’s movement. Its content is created by communities all over the world – people who keep updating “Oil Compass” map with oil, plastic or other sea pollution in their regions. all over the world by ocean currents. It is based on online databases and collected data. It visualises real time data of oil tankers marine traffic and position of oil rigs, thus advocating of data transparency. The projection-based installation is made with open source programming language VVVV. Microsoft Kinect is used to track gestures enabling viewers to unravel visualised data with their hands, thus “spilling” virtual oil. It is a comment on our consumerism culture – demonstrating that a lot of unnecessary products and packaging we tend to buy requires a large proportion of oil as a ingredient and a power/energy for production. Etienne Gernez is a maritime engineer. Currently acting as Academic coordinator for Protei. He’s working at DNV (Det Norske Veritas) in Oslo, Norway, in the Ships Hydrodynamics and Stability unit (NTANO362). He is a graduate from the University of Southampton (UK), the University of Bordeaux (France) and the University Centre of the Westfjords (Iceland) in Numerical modeling, Maritime Engineering Sciences, and Coastal and Marine Resources Management. Gabriella Levine is an international interactive artist and open-source hardware designer interested in the relationship between technology and ecology. She recently graduated with a Masters (MPS) degree from ITP at Tisch, NYU. She is the Director of Open-H2O, a global community and US-based non-profit developing oil-collecting robotic sailboats called Protei. Kasia Molga is a media/interactive artist working with and often hacking live data visualisation, sensory and mobile technologies. Her practice is concerned with our relationship with the planet and changes in our perception towards environment in this increasingly technologically mediated world. She has spent her childhood travelling with her father on the merchant navy vessels around the world and her passion for sea and planet is present in most of her projects. Sebastian Muellauer explores and invents on the intersection of the fields of art, design, architecture and engineering. His works show a focal interest in ecology and experimental humanitarian design development. In his practice he advocates values and ethics of collaboration, community and open source/hardware.